A slightly larger replacement for Beovision MX 2000. Inside, it is all new, though still not of completely B&O design. By this time, Nordmende had been taken over by Thomson of France, and the new chassis was called the ICC5. This chassis was also much used by Ferguson in the UK, an undesirable state of affairs given the price difference between the B&O and Ferguson ranges. Of course there were differences, the control system in the MX 3000 was of B&O’s own design, and allowed the new Beolink 1000 terminal to be used, or the new style Video terminal, which looked very similar. There were also extra connections for Aux. Audio Link and AV Link. The latter became useful later on, when the VX 5000 video recorder was introduced. The compact dimensions of the set left no room inside for the Beosat LM built in satellite receiver, but the Beosat RX, a separate unit, could be connected and operated via the AV Link connector. The Teletext decoder was improved by the addition of a page memory, up to four pages could be stored for each channel. Text copyright © Beocentral. Unauthorised reproduction prohibited. On the outside, the flip up panel above the screen was replaced by on screen menus and two push buttons, one for mains power and one for channel up, located beneath the loudspeaker grille. Gloss blue was added to the choice of cabinet shell colours, though it was not very popular. A new stand, called Stand 3000, was introduced, and there was a version of this that included a shelf for a video recorder. Text copyright © Beocentral. Unauthorised reproduction prohibited. 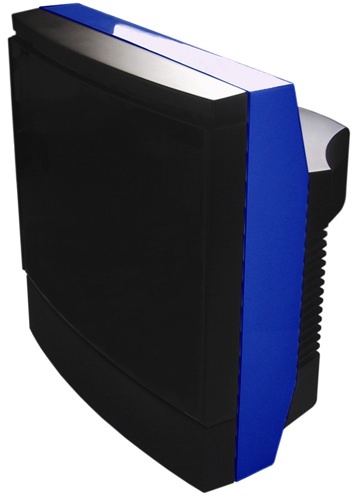 The ICC5 chassis was never completely satisfactory, in particular the power supply stages were prone to extensive damage as a result of spikes in the mains supply, and the printed panel suffered similar cracking and burning problems as the MX 2000. Even the picture tubes employed were poor, many of them loosing emission after only a few years. Many updates and modifications were issued, but the basic problems remained. Text copyright © Beocentral. Unauthorised reproduction prohibited.